With Snowdon, the highest mountain in Wales and Beddgelert for the legend of Gelert close by. Walks, rambles, rock climbing, lake and river fishing, forests walks and cycling. 6 miles away we have the famous Italian village of Portmeirion, Porthmadog a harbour town for sailing, wonderful beaches,delightful sandy coves at Borth y Gest and a long sandy beach at Morfa Bychan. Close to the beautiful Isle of Anglesey where you can have day trips to Ireland. The famous Ffestiniog and Welsh Highland Railway steam train attractions. The Welsh Highland Railway track from Caernarfon to Porthmadoc is complete with a halt in Nantmor, only 100yds from our cottage. 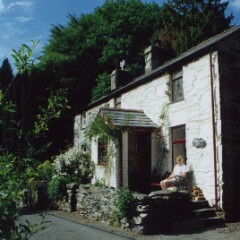 The dramatic splendour of Snowdonia is the setting for the delightful cottage of Bron Meirion. Nestling in the picturesque and peaceful hamlet of Nantmor, it is just one and a half miles from Snowdonia's loveliest mountain village of Beddgelert, where Snowdon, the highest peak in Wales dominates the skyline a few miles to the North. Beddgert, a most endearing riverside village, with its famous legend of Gelert, has all the amenities of shops, restaurents and Inns. Our deceptively spacious stone built cottage sleeping six guests plus cot is situated in the centre of the village of Nantmor with views of the mountains to the front and from the balcony. It has immense charm and character with beamed ceilings, stable doors and painted stonework, three double bedrooms; one with a balcony. 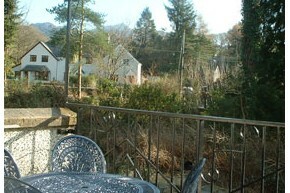 Nantmor is situated above the beautiful Glaslyn river valley. Scenic walks and rambles from the doorstep of the cottage include the ‘fisherman’s path’, which takes you along the rhododendron adorned slopes of the river Glaslyn to Beddgelert. Enroute watch the canoeist challenge the river rapids. Permits can be obtained for river fishing. The majestic mountains, forests and glistening lakes; which could be called the Lake distict of Wales, all add to a wonderful holiday. A little further afield is Porthmadog, a harbour town with steam train attractions, cinema, numerous shops, restaurants, Inns, an 18 hole golf course and driving range. Nearby at Morfa Bychan, there is a long expanse of golden beach. Just six miles away we have the famous village of Portmeirion, and a little further afield are the Castles of Caernarfon, Criccieth and Harlech. Catch the local Sherpa bus to explore some of these places if you don't wish to drive.